Fisheries producing small, fatty fish like mackerel, herring and sardines generate fewer carbon emissions. Here, 10 delicious fish recipes to help save the environment. Mackerel’s strong flavor pairs well with a simple mustard-and-dill-spiked mayonnaise. These tasty sandwiches feature creamy roasted-garlic puree and smoked-mackerel fillets. Sweet raisins and bold mackerel are fantastic in this version of the Sicilian pasta con le sarde (pasta with sardines). Pickled herring stars in this fantastic hors d’oeuvre. A tangy herb-and-fennel salad tops the healthy, easy-to-grill sardines in this quick recipe, which can be served as an appetizer or main course. 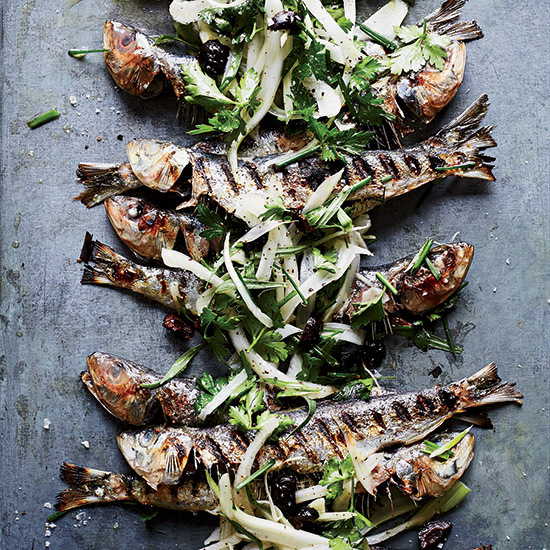 These delicious sardines are grilled the Portuguese way—with olive oil and coarse salt. Even those who don’t love sardines will enjoy this tasty salad with its garlicky sauce. Slices of juicy tomatoes topped with anchovy fillets are a fast and delicious appetizer or side dish. Ready in just 10 minutes, this Asian-inspired dish is an easy weeknight dinner. Grilled radicchio, flavorful white anchovies and rustic Italian bread make for a twist on the traditional panzanella.